Tom Morris Golfer St Andrews. went to Prestwick to take care of the course there and back to St Andrews to become greenskeeper until he was 83. He also proved his skill as a golfer with four victories in the Open championship, in 1861, 1862, 1864 and 1867. Old Tom's son, the other Tom, was born in 1851 and became an outstanding golfer. He was only 16 when he won the Open at Montrose, against the best the country could deliver. Nobody could match the boy. He got the championship belt outright by virtue of his three successive victories in 1868, 1869, and 1870. 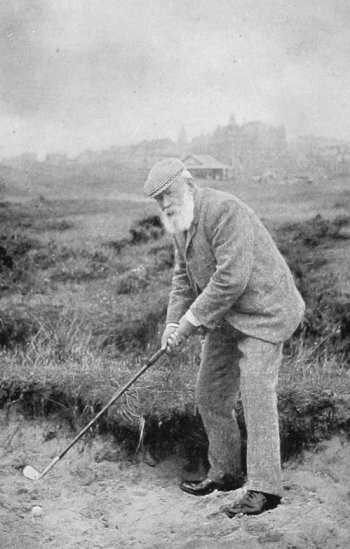 The Open was not held in 1871, no one had put up a new prize to replace the trophy. Young Tom had won in 1870, but in 1872 a cup was donated for the Open trophy, and Young Tom won the ensuing championship. He was just the best, but there was a doom on him. In 1875, he was actually playing in a big match when a telegram arrived to tell him that his young wife was seriously ill. He wasn't given it. A second telegram reported that his wife had died in childbirth. He was devastated, and he himself died a little later. He was only 24. Old Tom Morris and young Tom Morris are big names in the history of golf, and St Andrews has several memorials to the family that helped to make the game the worldwide enthusiasm it is today.